It’s holiday time, and holiday time is shopping time. Now if you’re anything like most people, a fair amount of your shopping is done online. Even if you don’t actually buy from an online retailer, you probably do a fair amount of your research using online reviews and they are our topic today. A marketing solution provider called Uberall released its “Customer Review Report,” which analyzed how consumers evaluate reviews online. They found that consumers think brands should be very active online responding to reviews. In fact, 65% of consumers think brands should respond to every online review every time, whether the review is positive or negative. Other observations from the study were that 18% of consumers believe brands should respond only when the review is negative, while 10% feel they should never respond, and 6% think they should only respond when the review is positive. How do you feel about it? Personally, I think it’s critical that brands monitor the reviews of their products and not only should they respond but they should also verify. I’ve found that review verification sites such as Fakespot provide a wonderful service. I recognize that some brands actually pay for fake positive reviews in order to mask the crappy stuff they’re selling. That’s short-sighted since the revenues they make will be far offset by the costs of returns, customer service calls and maybe even lawsuits. Running an Amazon URL through Fakespot or ReviewMeta can save you a lot of trouble and also tell you a lot about how well a company curates its reputation. There was a study a few years back that found that 20% or so of Yelp reviews were fake. You can spend $1 to get one written and you just might end up having to pay up to $40,654 to the FTC for having done so. Online reviews are a great source of, if not THE best, information for consumers and a generally accurate reflection of how your brand is perceived. You should influence that perception through positive interaction and not through creative writing. Most of all, you should respond, especially at this time of year when it’s a crucial sales period for most brands. Are you doing so? Does Your Business Serve Pu-Pu Platters? This Foodie Friday, I’m inspired by the memory of a long-closed (by the Health Department as it turns out) restaurant called South Seas. It served very large “exotic” drinks – Zombies, Scorpion Bowls, the full range of tiki bar delights – and the first pu-pu platter I’d ever encountered. My high school friends and I would often meet up at South Seas to gather in front of a glowing pu-pu platter. The center was a grill, fueled by Sterno I think, on which we could cook something from the mound of delights surrounding it. Of course, everything had been fried and I was never quite sure why one would want to further cook an egg roll, but it was very foreign and wonderful. Of course, since they would serve both the food and the drinks to anyone (the drinking age was 18 but our 18th birthdays were a few years away – sorry Mom), I might be misrecalling how good the food was, but I really loved it. It’s the pu-pu platter that triggered the business thought. While most of us had after-school or weekend jobs of some sort, none of us really had a ton of disposable income for food. The Pu-pu platter solved that problem by being a cost-effective alternative to having to order several different plates. We could graze as we saw fit without having to commit to one dish. As I think about it now, many other types of cuisine offer their version of a pu-pu plater: the mixed antipasto (hot or cold) most Italian places serve, the popularity of tapas places (you’re sort of constructing your own pu-pu platter as your order many different little plates), heck, even the canape platters they pass around a cocktail parties are pu-pu platters in my mind. And I think there’s something your business can take away from that. The pu-pu platter or antipasto plate lets the customer sample multiple facets of your kitchen. It lets them understand the quality and variety of what you offer without their having to make a major commitment. That’s not a bad idea for any business. Free consultations and low- or no-cost trial periods are one way to deliver this. Offering a little bit of everything, much like a country store does, might be another. I hasten to add that anything you do offer needs to be of the same high-quality as your main product or service offerings. When I see a pu-pu platter on a menu these days, I’m still tempted to order one so I can have a little taste of everything. 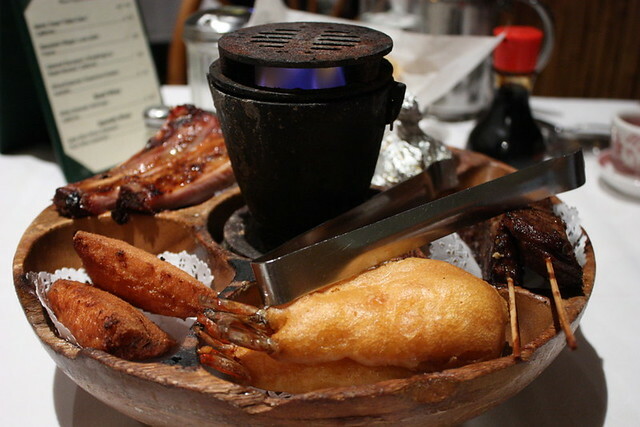 Keeping a pu-pu platter mindset might just be a way to grow your business, don’t you think? Way back when in 1995, I was working at ABC Sports as their VP of Marketing. My job entailed meeting with advertisers and constructing packages of media and on-site benefits. We’d collaboratively design in-program elements, popularly known then as “enhancements”, to capitalize on the marketers’ involvement with a sport or an event. These things all took place on-air or on-site. The other big “on” – online – didn’t exist. One day the president of ABC Sports walked into my office and asked me if I knew anything about computers. As a user of AOL, Prodigy, Compuserve and other early services, I replied that I did. He informed me that I was in charge and was to attend a meeting. ABC corporate had made a deal with this little start-up of under a million users called America OnLine and I was now to provide sports programming on behalf of ABC. That was my pivot into digital. I didn’t realize it at the time, but saying “yes” to my boss’ question and being willing to take on some new, different responsibility had changed my life forever. None of us knew at the time that digital was going to disrupt the television business. We certainly didn’t think of it as anything other than an interesting sideline. But we began to see a little money coming in based on what we were doing, and once in a while, I could add some online stuff to the broad package of rights and benefits I was offering in my “real” job. Less than 5 years later, my job had become fully centered on digital, as I was now running a division of the NHL that didn’t even exist when I entered the digital world. Being willing to pivot is a critical thing. Many businesses would be long gone if they were unwilling to do so. Foursquare, for example, pivoted their business from a consumer product to a B2B product, providing “location intelligence” to marketers. 90% of their revenue comes from that change. YouTube started as a video dating site. Nokia was a paper company. Twitter was a podcasting network. None of those businesses would be as successful, or maybe even exist, if they hadn’t been willing to shift their business paradigm and pivot. I’d love to tell you that I saw the digital tsunami coming and got out in front of it on purpose but that would be a lie. I was lucky enough to ride the wave once it did show up because in my mind we were just doing what we’d always done – making great content and deriving value from the attention users gave it – albeit through a very different channel. The pivot was allowing my mind to be open enough to make that connection and to take the risk that it would be a rewarding road. Is your mind open to things like that?